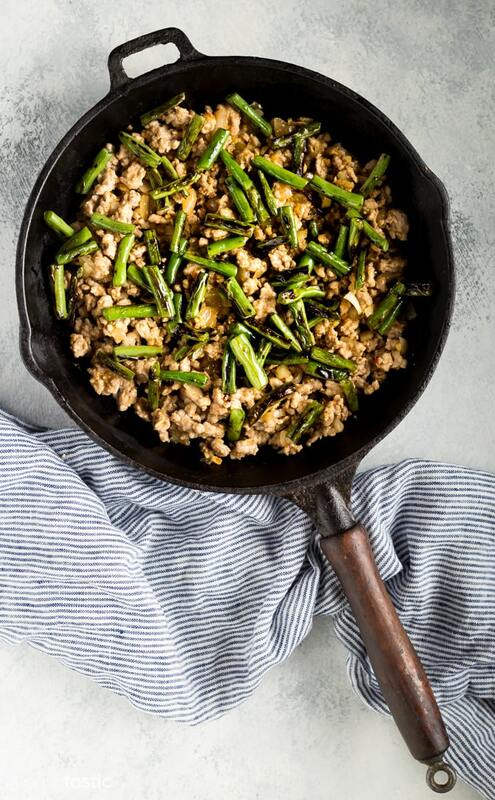 My Low Carb Pork Stir Fry with Green Beans was a surprise hit with the whole family last week, it’s such a simple recipe but the taste is phenomenal! 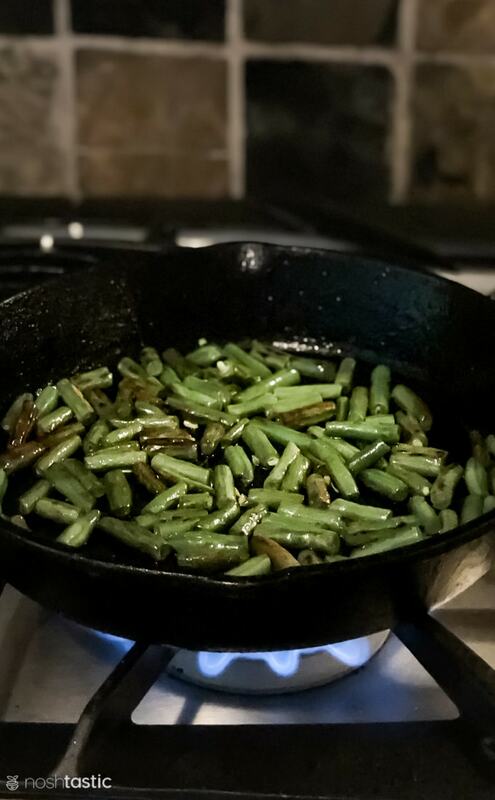 The great taste is due in part to the method of charring the green beans in a very hot skillet, this produces a flavor that’s far superior to steamed green beans, I may never eat them steamed again! Added to that is a very simple low carb and keto friendly stir fry sauce that has only three ingredients and you’ve got a winning dinner combination right there! 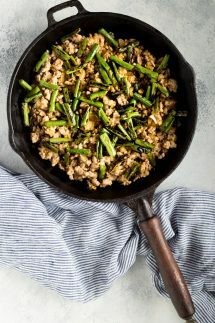 In a bowl mix together the dry sherry, coconut aminos, and chili garlic sauce to make the low carb pork stir fry sauce. Measure out about one half pound of green beans and then trim off the ends. Then cut the green beans into smaller pieces, about two inches long is a good length. 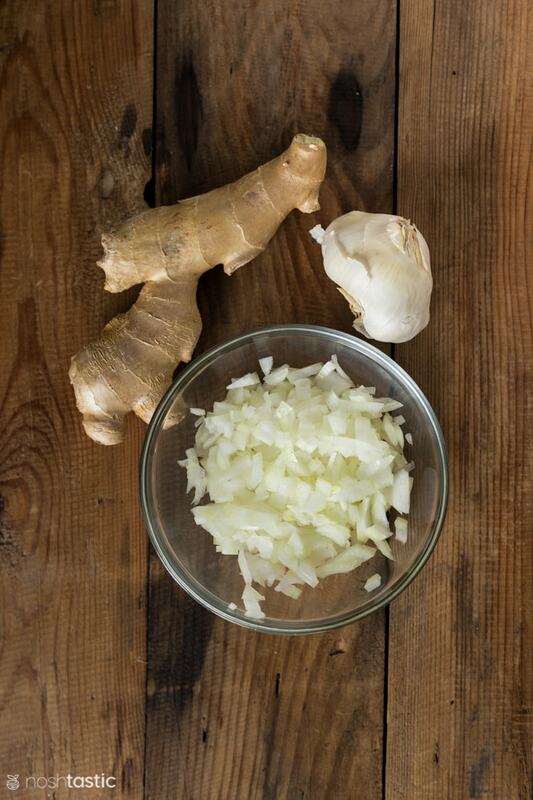 Cut and chop the onions, grate the ginger, and chop or mince the garlic and set aside. In a large cast iron skillet, heat one tablespoon of coconut oil over a high heat, or you can substitute another oil if you prefer. 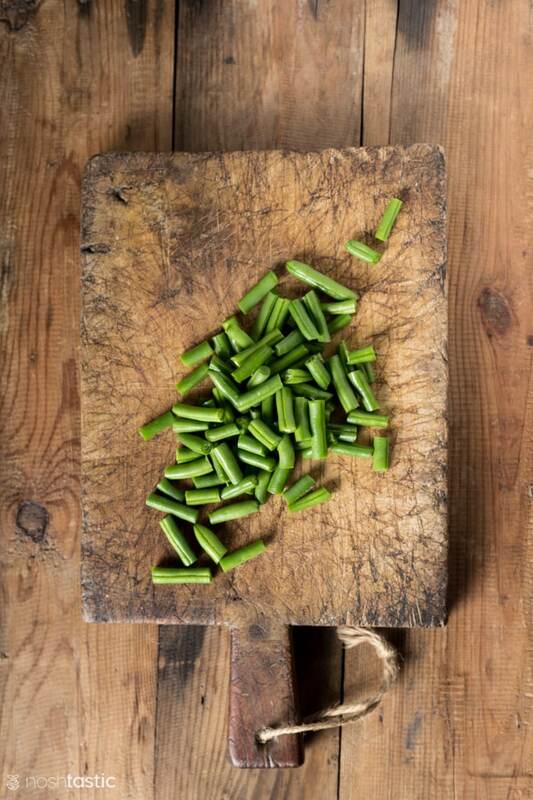 Add the chopped green beans in one layer to cover the base of the hot cast iron skillet. You need to cook the beans quickly over a very high heat to get that wonderful char on them, but without burning them. Start to cook them for about a minute, then turn the beans and cook in 30 seconds increments until you get a nice char on most sides of the green beans. Then go ahead and remove the cooked beans from the skillet and set to one side. Next, turn down the heat to medium-high and add one tablespoon of coconut oil and add the onion, garlic, and ginger. Cook those for about a minute or until edges of onion start to turn a golden color. Then add the ground pork and stir fry it, taking care to break the meat up into smaller chunks as it cooks. 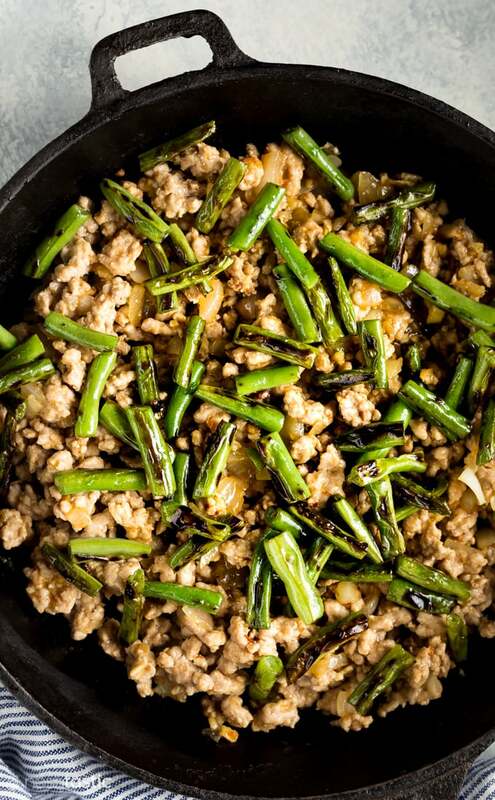 Add the low carb stir fry sauce to the pork, give it a stir, then return the green beans to the skillet and warm through and serve hot. This is a staple in my kitchen and I use it daily for cooking all sorts of things. If you don’t already have a cast iron skillet I’d urge you to get one. I have this set of cutting boards and it’s served me well, and can go in the dishwasher. This is very similar to the large sharp knife I have in my kitchen. 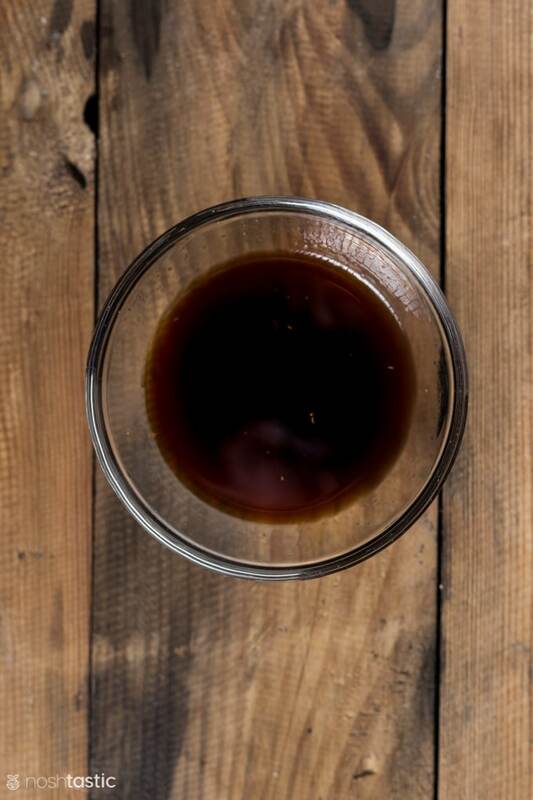 I love to use coconut aminos as a replacement for soy sauce, it’s similar but not the same. Mix low carb pork stir fry sauce ingredients in a bowl and set aside. 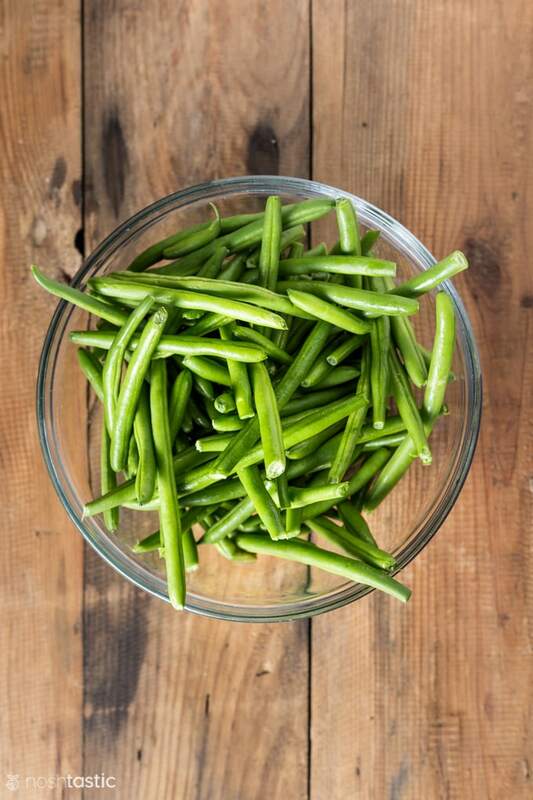 Trim the green beans and chop them into roughly 2" pieces. You will need a large wide base skillet, such as a cast iron skillet. heat 1 tbsp oil over a high heat. Add the green beans in a single layer covering the base of the skillet. cook for 1 minute, then quickly stir the beans, let them cook for around 30 more seconds, and repeat once or twice more so that the beans are evenly charred on most sides, but still tender and not over cooked. Then remove the green beans from the skillet and set aside. Turn heat down to medium-high, add 1 tbsp oil. Add onion, then garlic and ginger. Cook for 1-2 minutes. Turn heat back up to high. Add ground pork and cook, breaking it up as you go. 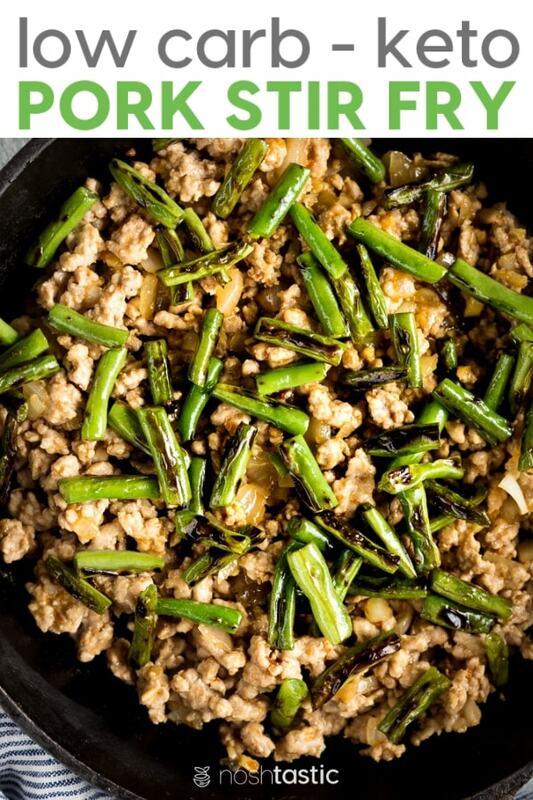 Cook for 2-4 minutes or until the pork is fully cooked, then add the low carb stir fry sauce. Just before serving add back the cooked green beans and warm through for about 1 minute more. Serve hot, over cauliflower rice or, as they are. 7g net carbs per serving, four servings per recipe.